The course at Torwoodlee Golf Club is situated just outside the Borders town of Galashields, where an inaugural 9-hole layout was set out many years ago on the banks of the River Gala by Willie Park Junior. Subsequently, when land became available on higher ground to the south of the property, on the other side of the old Waverly Railway Line, additional holes were added to complete a full 18-hole layout. A round on today’s course begins beside the fast running waters of the Gala, where holes 1 to 3 rise gently up to the recently refurbished footbridge that crosses the new Edinburgh-Tweedbank railway line. Holes 4 to 13 are then played out across somewhat hilly terrain on the opposite side of the tracks before the routing brings golfers back across the rail line to the final five fairways which lie within the locus of the original course. In truth, it’s a picture postcard setting for a golf course which offers a fine parkland challenge from the medal tees, where the standard scratch score is rated as one over the par of 69. With five par threes on the card and only two par fives, the overall yardage amounts to just over a modest 6,000 yards. A number of the holes are played uphill, however, so don’t be deceived into thinking Torwoodlee might be a golfing pushover. A couple of holes are worth highlighting on this delightful parkland track: the first is the 355-yard 6th (“Bowland View”), where the tee shot plunges down towards the green from the highest point on the course, the second is the 420-yard 13th (“Buckholm View”), which doglegs down to a putting surface that’s shared with the 8th hole, one of two double greens on the course. I’ve been meaning to play here for some time (especially after visiting the Hirsel course three years ago) and got the chance to do so when I competed in the club’s annual Gents Seniors Open the day before yesterday. 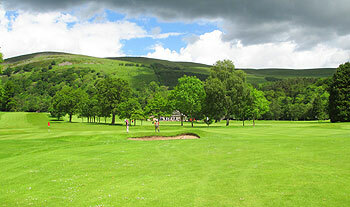 The opening and closing holes are played out on flatter ground, close to the clubhouse by the River Gala, with the other ten holes located on very undulating terrain on the other side of the railway line that cuts through the course. There’s a few uphill holes to negotiate during a round here, most notably at the stroke index 1 5th and 420-yard 16th, but, to counter balance the climbs, there are several glorious downhill fairways to cut loose on from the tee, especially at the (spectacular) 6th and, on the inward half, the 13th and 14th. I wasn’t impressed with the short par four 4th, where trees block out the approach to a two-tiered green, but this, thankfully, was the only two-shotter to induce a bout of head scratching on my part. I’m a big advocate of sensibly-sized par threes and four of Torwoodlee’s five short holes are just that, measuring between 124 and 176 yards. They’re all decent holes, especially the two on the front nine that play uphill because it’s always difficult to make that sort of hole attractive and interesting. It comes as something of a shock to the system to find the final one-shotter at the 17th is all of 234 yards from the back tees – I wonder what the original course architect, Willie Park Jnr, would make of this hole nowadays, even with the use of modern equipment? Having now played six of the top seven ranked courses in the Borders, I think Torwoodlee is probably positioned a couple of places too high in its regional chart at present so it’ll be interesting to see where it ends up when the next re-ranking exercise is carried out at the end of 2015.